How many web-connected devices are in your home? Give it some thought, as certain items - the TV or, these days, smart light bulbs - are easily overlooked. I'd have guessed at around a dozen or so in my own home, but I've just counted and there are a total of 16 gadgets that can connect to the Internet via my router. Scrap that, it's 17, I'd forgotten the digital radio in the kitchen. This proliferation of smart devices has put renewed focus on the once-humble router, which can now claim to be the core of our connected experience and an integral part of our homes. It's no surprise, then, that an array of manufacturers are upping their game with new solutions designed to improve our network experience. CES 2017 was brimming with gadgets and innovations from a number of big names suggests that this could well be the year in which the router takes centre stage. 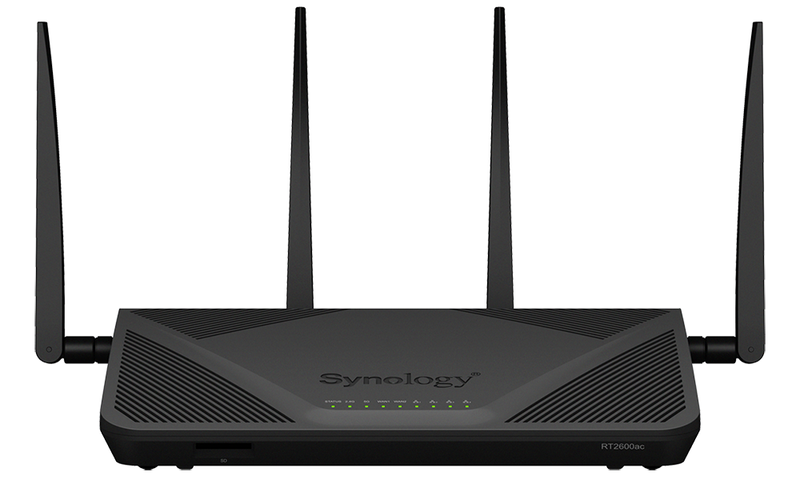 Synology, a relative newcomer to the field but a stalwart provider of networking products, is kick-starting 2017 with the launch of its second router, the RT2600ac. 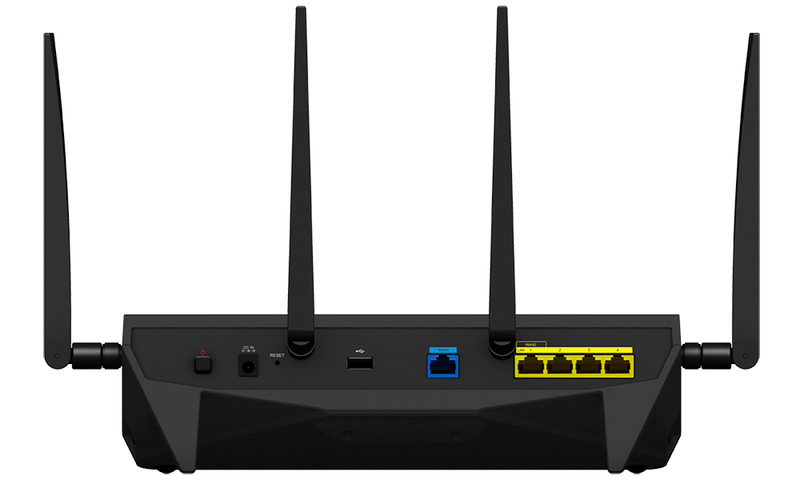 Building on the foundations laid by last year's RT1900ac, the new addition to the firm's fledgling range touts upgraded hardware, faster performance and improved wireless capabilities. 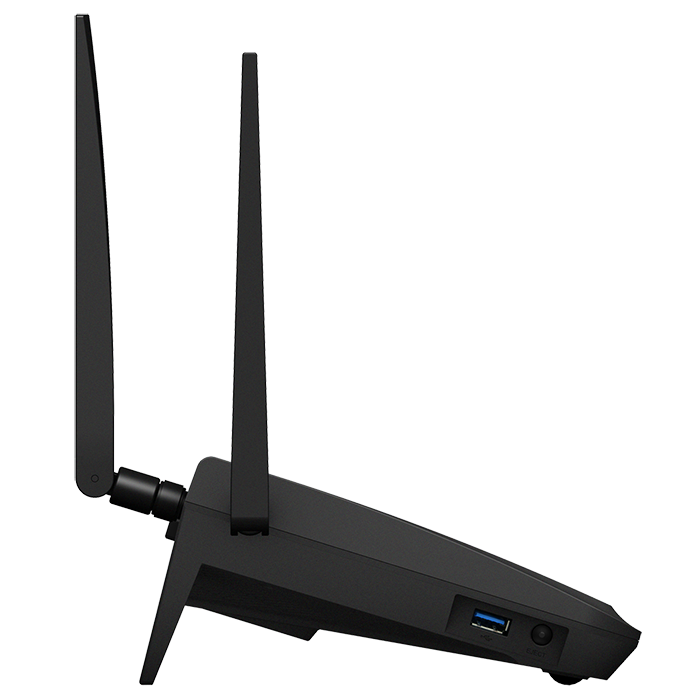 A dual-core 1.7GHz processor is partnered to 512MB of onboard memory, while a 4x4 antenna configuration offers wireless speeds of up to 800Mbps and 1,733Mbps on the 2.4GHz and 5GHz bands, respectively. Support for MU-MIMO, through which multiple compatible clients can be serviced more efficiently, allows the router to conform to the latest 802.11ac wave 2 standard, but the upgrades do come at a cost. 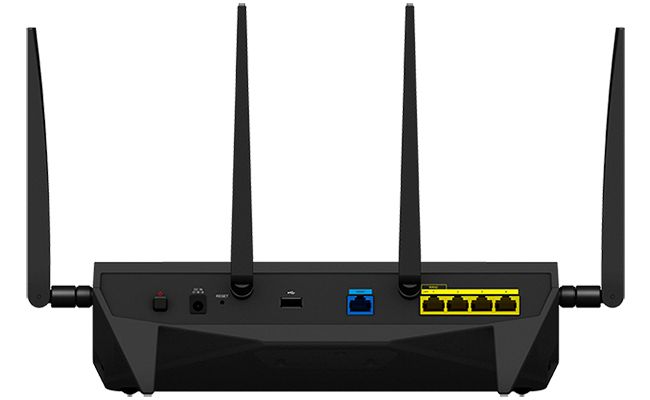 UK pricing is set at £210 and it's worth noting that the RT2600ac is unusually large for a router. 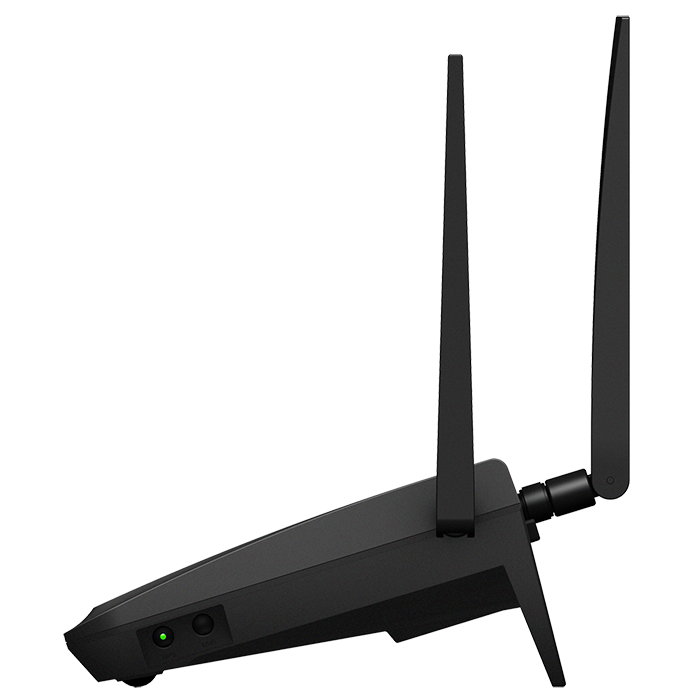 Dimensions of 77mm x 280mm x 169mm make it a bulky device that doesn't easily blend into the environment, and those measurements don't take into account the four antennae protruding from the back and sides. An all-black aesthetic could be considered business-like, and we like the fact that there are plenty of vents on the top and bottom to keep the unit running cool at all times, but it's not exactly a sleek or attractive addition to the home. 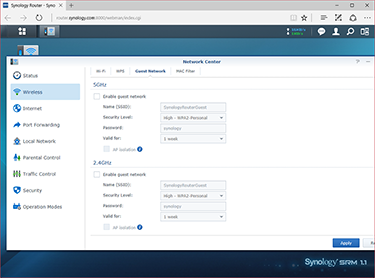 Around back, Synology includes a dedicated power button, a connector for the mains power adapter, USB 2.0, Gigabit WAN and four Gigabit LAN. What's handy in a business environment is that the first LAN port can double as a secondary WAN, allowing for connection to two ISPs with the option to configure the pairing in failover or load-balancing modes. The rest of the ports are on the sides, where the left edge is home to a USB 3.0 port and a backlit eject button, while the right edge is lined with Wi-Fi and WPS buttons. 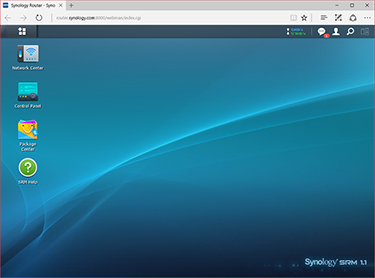 Synology has all the essentials covered - there's even an SD card slot on the front - but might it have done more? 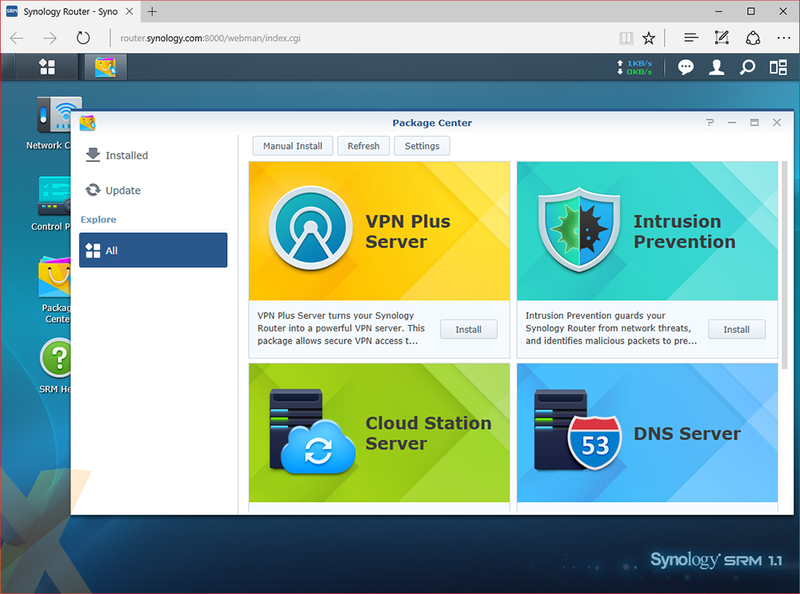 There's still no built-in modem, meaning extra clutter that home users may prefer to avoid, and considering the size of the unit, we wonder if Synology was ever tempted to add a dedicated 2.5/3.5in storage bay to allow the RT2600ac to double as a NAS. We're now seeing manufacturers introduce intriguing mesh network solutions that blanket the home with coverage through multiple access points, and as such a single large box with multiple antennae is starting to feel old-fashioned. 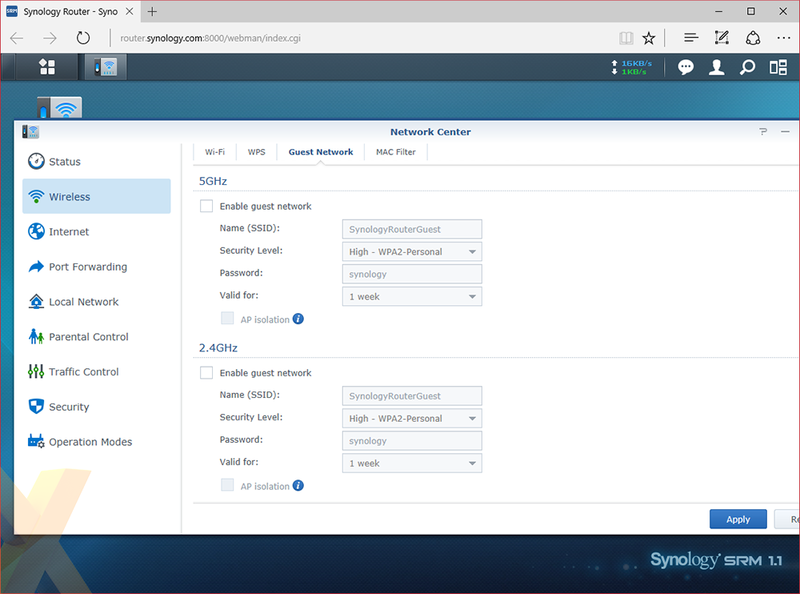 However, the same can't be said for Synology's accompanying admin panel, dubbed Synology Router Manager (SRM). 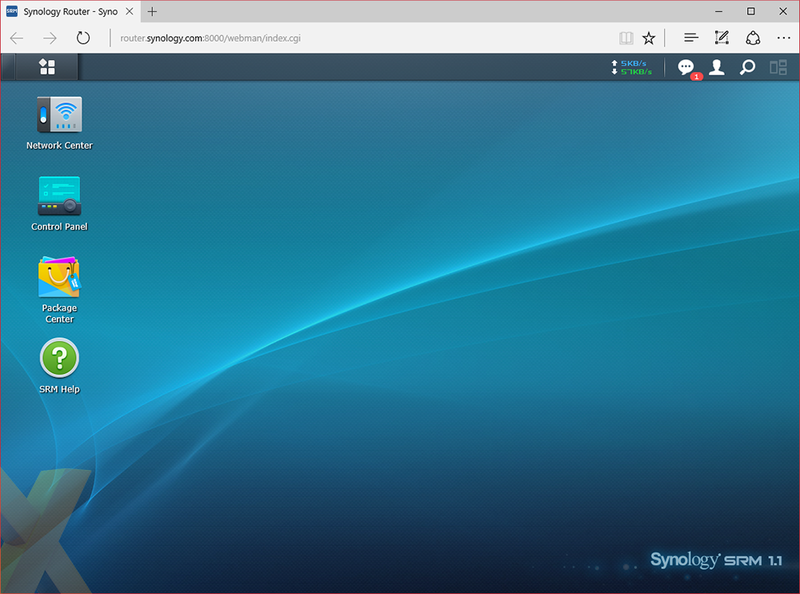 Adopting the look and feel of the firm's award-winning NAS operating system, SRM is immediately recognisable to anyone who has used a Synology product in recent years. It's also a breath of fresh air compared to traditional router admin panels that adopt a simple menu-on-the-left, options-on-the-right approach. SRM is both more intuitive and more engaging, with features end users are likely to use. Initial setup is as simple as following an on-screen wizard after pointing a connected web browser to router.synology.com, and once complete, the desktop-like interface makes it easy to multi-task and create shortcuts to commonly used functions. Our earlier overview of SRM goes into greater detail, but in a nutshell, home users can make use of comprehensive parental controls, guest networking and Smart Connect, through which both 2.4GHz and 5GHz bands are given one name to help simplify the overall experience. 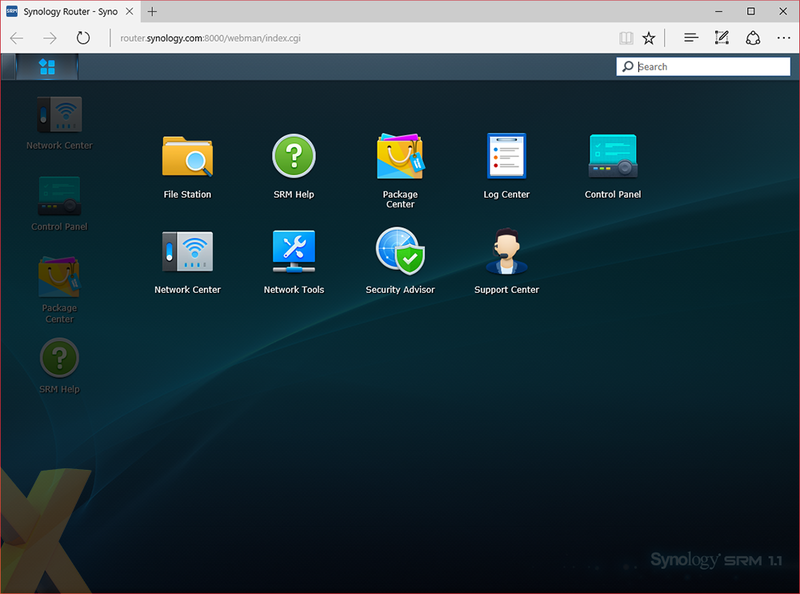 On top of these core features, a selection of apps have been carried over from Synology's NAS operating system. These include Download Station and Media Server, both of which make the RT2600ac a potent centralised data store with the addition of an SD card or an external USB 3.0 drive. There's plenty on offer for business users, too. Traffic management utilities allow for internet access to be restricted on a per-device basis, a built-in Security Advisor tools is at hand to guard against intrusion and SRM can also output detailed usage reports to keep tabs on which devices are spending all their time on Facebook. Visit the integrated app store, dubbed Package Center, and you'll also find VPN Plus Server, though which the RT2600ac can be configured as a fully fledged VPN server. 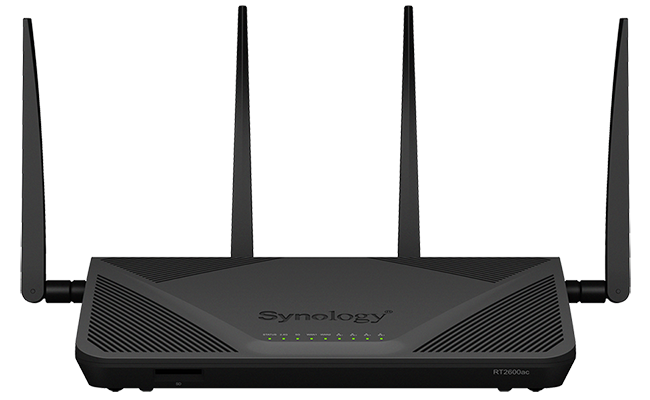 Synology's hardware isn't the prettiest and the combined wireless speed of up to 2.53Gbps isn't groundbreaking by today's standards, but it's the supporting SRM software that ultimately makes the RT2600ac a potent proposition for power users and small business environments.